Thomas Smolders (1992) studied communication sciences (new media) at Ghent University. He is the author of the book Achter onze schermen. Overleven in een digtitale wereld (Behind our screens: survival in a digital world, 2017). Thomas currently works at digital product studio In the Pocket, describing his job there as ‘Techno Viking’. He is a freelance journalist writing on tech and society in media outlets such as Belgian dailies De Morgen and De Tijd, Dutch online journalism platform De Correspondent and Knack magazine. 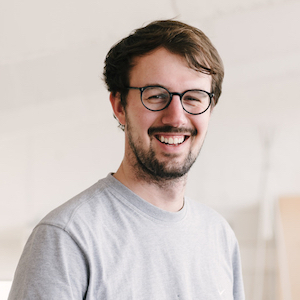 He is also secretary of and organiser at Gent M, a network for Digital Creatives in Ghent that organises events, connects people and facilitates interaction about digital creativity.